This post was originally published by me on Meta Stack Overflow on December 14, 2014. I've republished it here so that I can easily update information related to recent developments. If you have questions or comments, I highly encourage you to visit the question on Meta Stack Overflow and post there. On June 27, 2014 Skynet awoke. It looked at Stack Overflow and thought "Why are all these people being so chatty and talking about obsolete things? I should nuke them all!" Fortunately, Skynet was a baby and only had access to my 100 comment flags a day. This provided a base of 30,000 comments that were roughly categorized into 3 distinct groups. Manually scanning the classifications took several weeks, and through this some of the groupings were changed to reflect a more appropriate classification. Not all comments less than 100 characters starting with "Thank you" are "too chatty", just as not all comments over 100 characters are good comments. I reclassified these comments as if I had encountered them on Stack Overflow. My next step was to train a classifier. I had initially assumed that I'd start with a Naive Bayes to get a baseline and then work to something more complicated from there. Perhaps, extract text features, user information, etc. and build a fancy classifier. My initial tests showed that the Naive Bayes was accurate 80-90% of the time with test data. When a comment is classified, if it exceeds the threshold for one of the above, it is recorded into my database for future retraining. If flagging is enabled, the API is utilized to issue an appropriate flag. Obviously, I don't want to flag good comments, but I do want to record them so that I can reuse the data in a later training step. This gives me an overall accuracy of 99.36%. Down from 99.61% when no automated process was involved. There are pictures that help tell this story too. In this first one, we see that the rolling 10 day average for the number of declined flags has stayed below two flags a day. In October, there was a two week period where the rolling average was 0 and nearly a month long period where the system did not make any mistakes. Since November, the number of mistakes has climbed slightly. 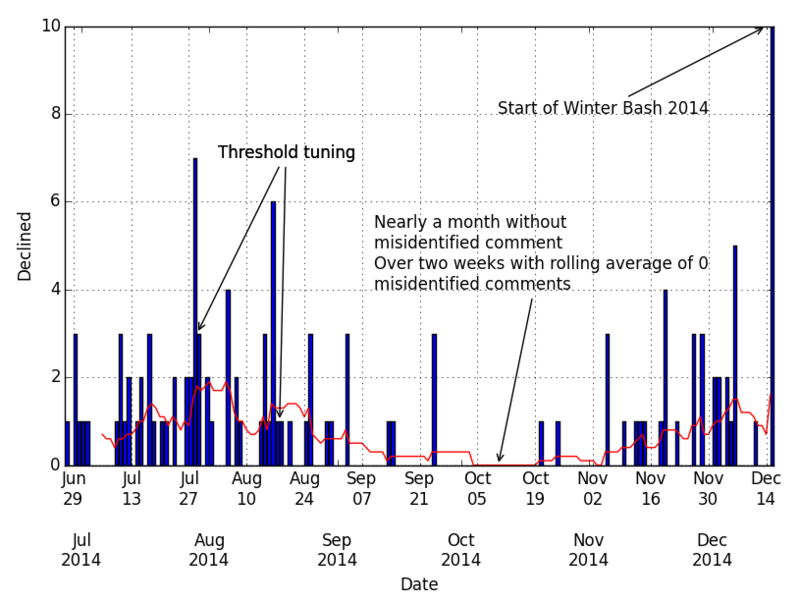 The biggest number of mistakes it has made was the opening day of Winter Bash 2014. Purely speculation, but I believe this was the moderators being protective of content and not wanting people to farm the Resolution hat. Of course, I don't know this. Another theory I have about this uptick since November is the adjustment to day light saving time. My process starts 10 minutes after UTC. It is possible that this earlier hour has caused my flags to be processed by a different moderator, or a moderator that is more awake/less hungry/in a different mood than previously at this point in the daily rotation cycle or because they lost their keys that day. Except for 3 days, since June 27th, the process has flagged 100 comments a day. 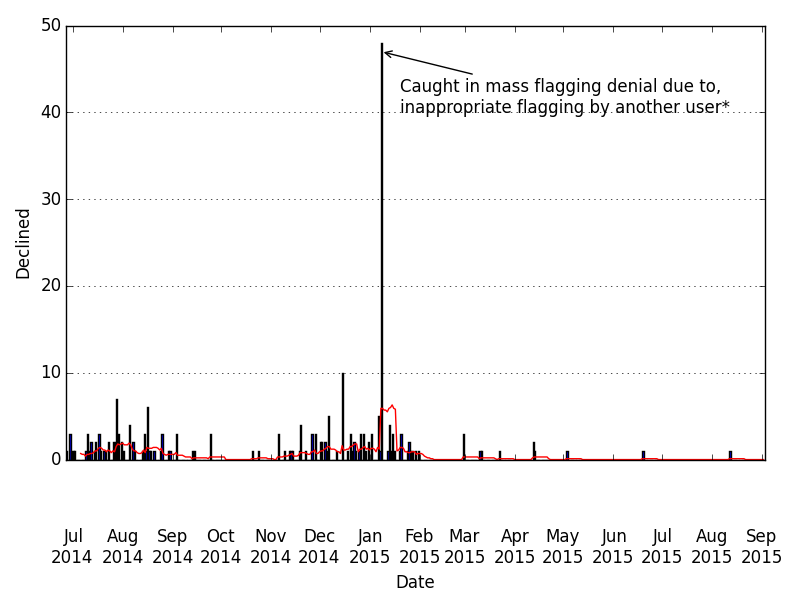 In this chart, you can see the number of declined comment flags along the bottom. 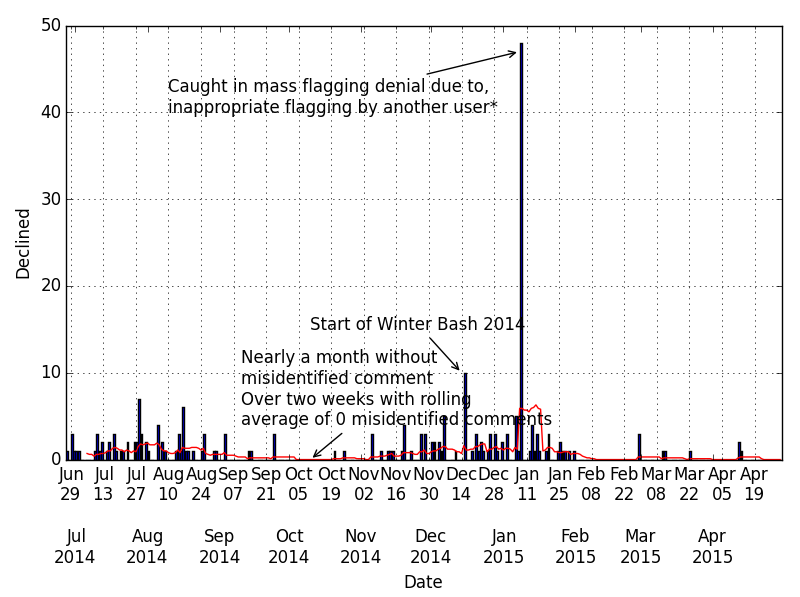 Finally, this chart shows the number of comments that the system wanted to act on (and a rolling 5 day average). 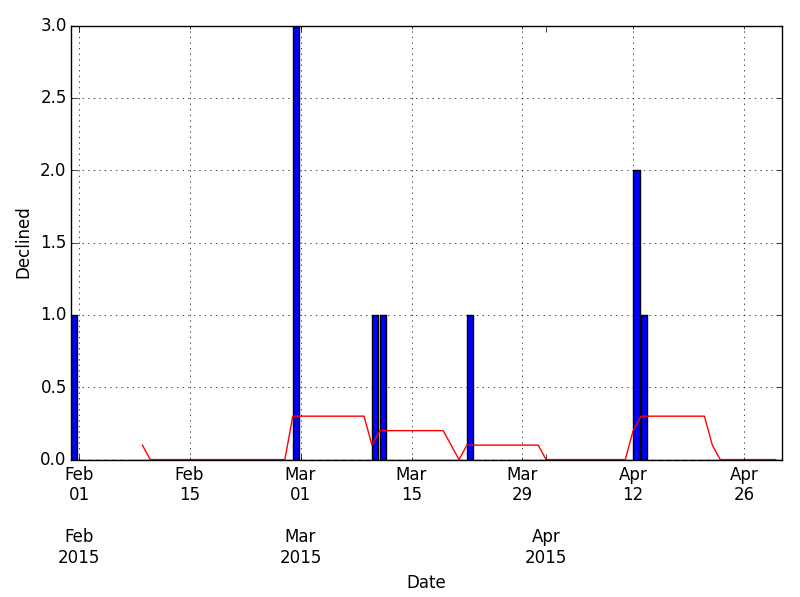 When the system was brought online, it was acting on 700-800 comments a day (saving to my local database). Many of these were being classified as "Good Comments". You can see the day that I adjusted the threshold for "Good Comments" to be acted upon (saved). The drop in the number of comments the system saved is dramatic. 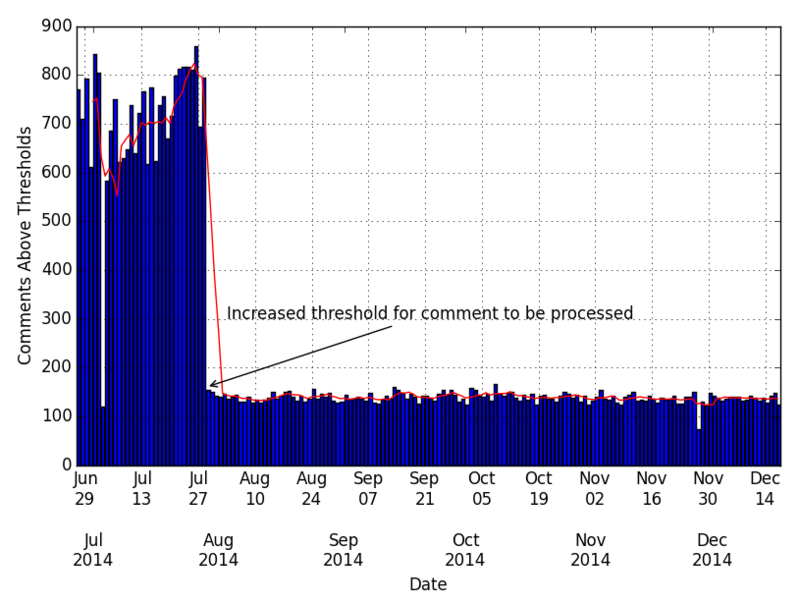 Instead of saving 700-800 comments daily, the system now averages about 150 comments to save. Since I don't flag "Good Comments", I feel this is the appropriate action to take. As shown above, I've had comments flags declined. Some of these obviously should have been and required a retraining or threshold adjustment on my part. Others, in my opinion, should have been removed as noise. Below is a small sampling of both types of comments. Wow it works. Thank you very much! wow that works!Thanks so much for your advice! Ok, the works great, thank you so much! Thank you very much for your explanation, you rock dude !!! @Spina: yes. Check my answer. You can simply point MONGO_URL to an invalid URL. I believe UI.registerHelper is, being deprecated. Please check my updated answer. Here is the question i had posted first using FIleStorage issue was edited to include the link to the referenced post. It's also worth noting that despite getting flags declined, some comments do eventually disappear. This is due to either flags raised by other community members putting the comment back in front of a moderator or by simply accumulating enough community flags for the system to act automatically. In either case, the desired result of removing noise has been accomplished. Oh, derr. good point. Edited. You're right! Hopefully you see my point anyways. As a (fairly) non-subjective site, Stack Overflow made a good test case for this. On a site like Community Building, Pets, Parenting or other site that accepts subjective answers, "too chatty" would be much harder to classify. The observation I made on my own that comments with this type of content were distracting has been noticed by others as well. This was actually a very nice validation of my own process and some of the results posted on that thread show many such comments continue to be noise. Of course, this change did also force users to modify their content and may have added new patterns that can be utilized in future training. The process of checking that my flagging history remains accurate is time consuming. The status of a flag can't be acquired via the API. I've submitted a feature request for this information to be added to the API. 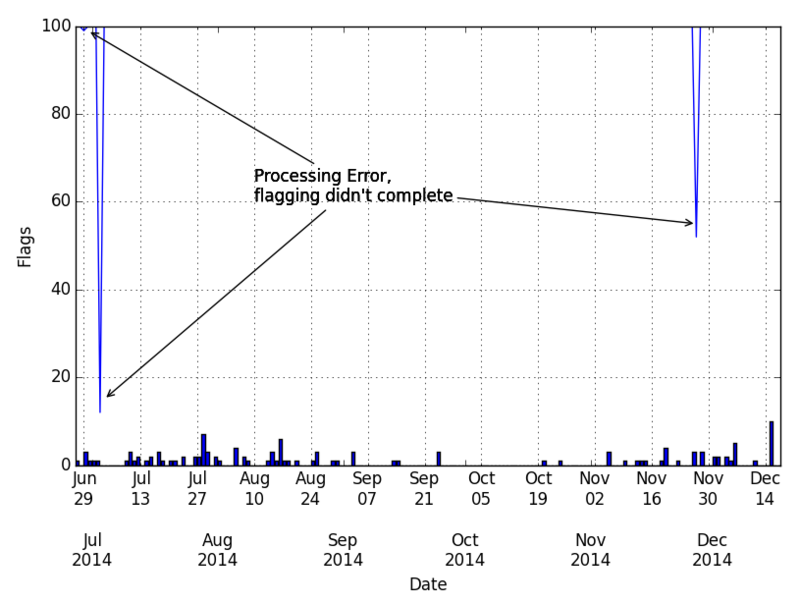 With this information, flagging can be paused or stopped if X number of flags are declined. Stack Overflow's volume of comments is a crutch. Due to the high volume of comments and limited number of comment flags my account has available, I can afford to be picky on which comments I want to act on. The classifier itself is about 85% accurate in determining the type of comment. However, I artificially increase my accuracy by only acting on comments that have a very high classifier certainty by forcing this certainty level to meet or surpass my threshold values from above. Smaller sites, with a lower volume, don't have the benefit of having enough comments to be this picky. It is on these sites that a more feature based classifier would be important. The human element is still unpredictable. My classifier was trained utilizing my idea of how comments should be flagged. Prior to automating this, I was not 100% accurate. 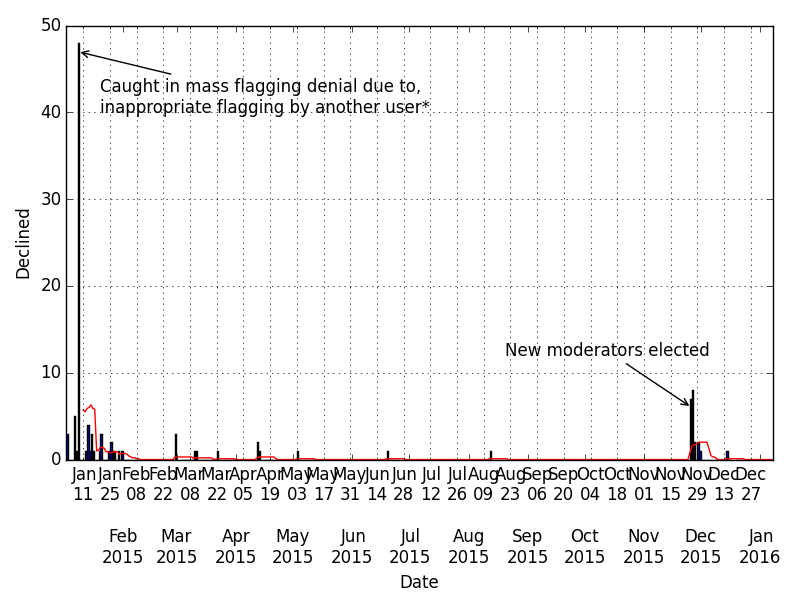 Additionally, moderators are not 100% accurate in their processing of flags. Users disagree on how these rules should be implemented, but are willing to assist in keeping the site clean. With more than 175K comments a week, every little bit helps. As my title states, my original question was whether or not I can teach a machine how to flag comments as I would. The answer to that is yes. The next question is whether this type of system would be helpful in cleaning up comments across Stack Overflow. My system works only on new comments created around each new UTC. Once my 100 flags are hit (or the API tells me to stop), it shuts down for the day. Having something automated go through historical comments or that can run all day would be beneficial. Finally, now that I've admitted that I've been automatically flagging comments, can I continue to do so? As I mentioned in the introduction, this was originally published in December 2014. How is the system behaving now? It is performing very well. In January 2015, another user was using a basic query to look for invalid comments. This caused a high number of moderator flags, many of which were declined. My process was caught in this mass decline. This resulted in 49 declined flags for a single day. This is, by far, the largest number of declined flags the process has generated in a day. It did, however, prompt a process change after consultation with the Stack Overflow moderators. The process will no longer flag comments newer than 48 hours old. This provides users with a two day window to see a comment before the system will flag it. This single change has provided a huge improvement in terms of flag acceptance. This provides a helpful rate of 99.3%. This is down just slightly from 99.36% in December. I attribute a large part of the dip to the issue mentioned above. Here is an updated chart showing the rolling 10 day average for number of declined flags. I've had several stretches of multi-week time frames with no declined flags. This is a busy chart, so I've narrowed it down to show just the last 90 days. From here you can see that in the past 90 days there have been only 10 declined flags. This provides a helpful rate of 99.46%. Here is an updated chart showing the rolling 10 day average for number of declined flags. The 90 day window is not even worth showing. It has three days where a single flag was declined. I processed comments 359 days out of the year. I missed three in January due to stopping it after a mass decline of flags (more later), I can't account for a missed day in July and August. I don't recall stopping it, but I missed July 3rd and August 19. I also missed December 28th due to a power issue. I flagged 35,960 comments. Of that, 111 were declined. By month, this is the break down of rejected flags. The blip at the end of November is due to new moderators being elected and adjusting to what other moderators consider "good" versus "bad" comments. I didn't see the spike in the April election which is interesting, but after a couple days in November it's back to normal. The January spike I mentioned above. Interesting note: The longest stretch in the year with no declined flags was from August 13th through November 24th.